During Kaporos, some Jewish practitioners in New York, as well as locations in other large cities, wave chickens, held by their legs or wings pinned backward, around their heads while chanting verses about transferring their sins and punishment symbolically to the bird. See Brooklyn Kaporos video here: https://www.youtube.com/watch?v=N9QNYaDIiJA. 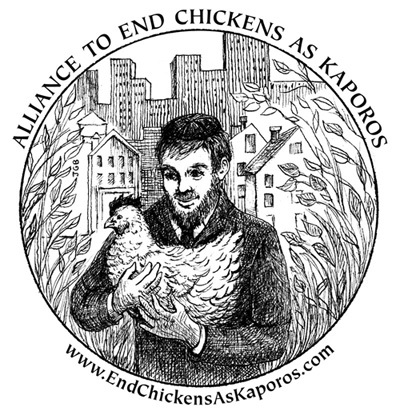 “ In 2010, I founded the Alliance to End Chickens as Kaporos, a project of United Poultry Concerns (UPC), after witnessing years of Kaporos horrors,” said Karen Davis, PhD, who also founded UPC. She added, “We know it is difficult to attend a demonstration where animals are suffering and dying in front of us, but as hard as it is for us, it is infinitely harder for the chickens. We must be there for them and show them and everyone else that we care for them and are fighting for them.” The Alliance includes support from Animal Cruelty Exposure Fund, Long Island Orchestrating for Nature, New York Farm Animal Save, The Animals’ Battalion, GooseWatch NYC and Their Turn.